This was on Saturday mornings around 11, I think, circa 1995-97. This show is NOT Hypernauts, but looks similar. There were more kids in the show, five I think, but they did have gray and different colored uniforms like Hypernauts did. No mechs. They traveled on a space ship together. I don’t why or what their mission was. There’s only one episode I remember. At the beginning of this episode they are on some sort of port planet where they are looking at the street vendors. I think the city floating they are is either in the sky or floats ala Cloud City. One of the girl crew members is looking at a necklace for sale, but decides that she can’t afford it. The guy crew member she was with secretly trades (his harmonica?) for the necklace and gives it to her as a gift. The kids spend the rest of the episode trying to find a way to get these people of this planet/region to stop poaching the creatures. Eventually they find out the gas/chemical inside them is actually produced by surface vents in the planet and that the people there can harvest it from the planet surface directly. This saves the creatures from extinction and it ends on a happy note. 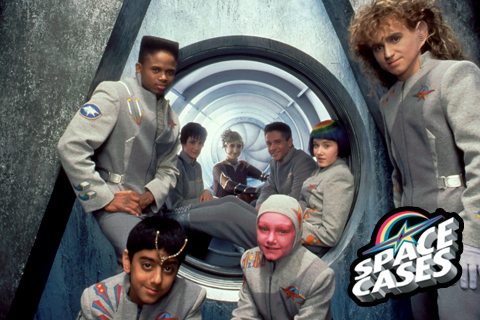 I haven't seen it, so I can't say for sure, but it sounds like Space Cases, a Canadian show created by Peter David and Bill Mumy. It's from 1996, and has kids with gray and colored uniforms (see picture). It features, among others, Jewel Staite, who later gained fame as Kaylee in Firefly. UPDATE: it IS Hypernauts and I’m an idiot. I didn’t think it was Hypernauts because everything I had learned about that show didn’t quite line-up with what I remembered. I honestly thought there were more than three kids, that there were no mechs, and that the show had a lighter tone than Hypernauts appeared to have. What I had never done was go through the episode list and check each to see if there was a chance that one of them fit. I never tried that...until just now. I checked all the episode synopses for Space Cases when it had been suggested to me just to rule that out, but I never thought to do that with Hypernauts; don’t know why. I found something on Wikipedia about a couple of episodes that made me search a little deeper. Came across a more detailed description of those two episodes and realized that even though I had jumbled two episodes together, the show I was looking for was, in fact, Hypernauts. There were no mechs in the primary episode I remembered, and the one I jumbled with it only has them in the last 3 minutes of the show (which I probably didn’t catch the first time) which which is why I guess I never thought they could be the same show. I found the episodes on YouTube and confirmed that the scenes and dialogue match. They don’t look quite the same as they did in my head, but a I guess 23 years will do that to a memory. This episode contains the scene with the necklace traded for the harmonica and given to the girl. I inadvertently mixed this together with the next episode. The Hypernauts visit the planet Cloudholm to warn its people of a Triad probe heading toward it. Max takes up the cause of trying to convince the Hakita that fliers, a native species, are an intelligent species and should not be hunted. This episode has the creatures I likened to whales, but are actually closer to mantas. The conversation about the whales being discovered to be intelligent and one of the kid’s grandfathers being a lawyer for one (I remembered it a bit wrong) is there too. Not the answer you're looking for? Browse other questions tagged story-identification tv space or ask your own question. What was this game show on UK Saturday morning TV?